Uniform application of gestational diabetes diagnostic thresholds may not be appropriate in populations across the world. Fetal genetic score for birth weight affects fetal growth at various maternal fasting plasma glucose levels. This study demonstrated the importance of early screening and diagnosis of type 2 diabetes in mothers and their offspring. Investigators developed a community-based pre-pregnancy care program to improve pregnancy outcomes. A tailored electronic health record letter may improve gestational weight gain and reduce postpartum weight retention. The researchers found that, compared with women without gestational diabetes or subsequent diabetes, women with a history of gestational diabetes had significantly higher estimated glomerular filtration rate. Findings do not support noninferiority of glyburide for prevention of perinatal complications of gestational diabetes. 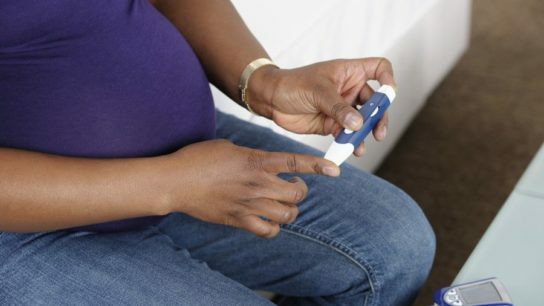 Antipsychotic Use and Gestational Diabetes: Is There a Link? Results showed there was a significant crude risk linked to continuing vs discontinuing certain antipsychotics and developing gestational diabetes; for quetiapine the risk was 7.1% vs 4.1% (adjusted relative risk [ARR] 1.28), respectively; among olanzapine users it was 12% vs 4.7% (ARR 1.61), respectively. Researchers assessed the associations of pre-pregnancy fitness, moderate-to-vigorous-intensity physical activity, and time spent watching television on subsequent development of gestational diabetes. Parents and healthcare workers should carefully consider the risk for obesity in infants born to women with diabetes, especially infants born large for gestational age, and should initiate preventive measures where possible.